You can use Olaplex as a tool or a new service. The choice is yours. 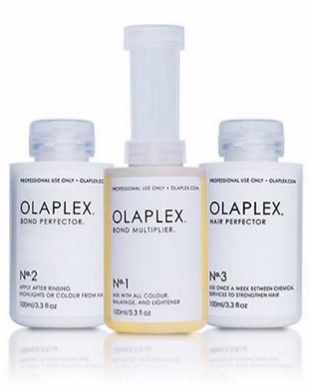 As a tool, use the Olaplex Bond Multiplier No.1 adding it to lightener or color and finish by applying Bond Perfector No.2 after color is rinsed from the hair to dramatically reduce breakage with every color service. This entry was posted in and tagged balayage, bleach, blonde, blonde hair, hair, hair salon, hairdresser, healthy hair, olaplex, ombre on April 25, 2016 by admin. I’m sure most of you have seen the “yard sale” sites on Facebook with people asking for cheap people to do their hair (color, cuts, waxing, nails, etc). Many times there will be comments from stylists saying cheap isn’t a good thing, so I wanted to elaborate on that a little more. 2. While in school, licensed cosmetologists not only learn how to enhance their client’s outer appearance, but we learn proper sanitation to prevent the spread of disease and infection. If you have never seen how bad MRSA can get (it can kill you too!! ), feel free to google MRSA Infections. It’s not pretty. And that’s not the only thing that can get spread with tools not properly sanitized. Aids/HIV is another big problem with not properly sanitized tools. The last thing anyone would ever want to happen is to save $10 on a cut and end up with a disease for life. 3. We guarantee our work!! Working at NY Hair Company has taught me that my clients matter more than rushing people in and out to make a little extra cash from squeezing in one more color service into my day. Nothing is better than seeing my clients walk out the door with a smile on their face (I love the hugs and happy tears too!!) and always wanting to come back. Loyal clients stay loyal because we work our butts off to make sure we can get your hair, make-up, skin, etc closest to your desired look without jeopardizing the integrity of your hair. 4. We use the best professional products (in our opinion. Everyone likes different lines, but we love our Matrix!!) because it’s better for your hair! The reason we don’t use box color (even with a professional name on it like Sebastian) is because most of them are either extremely damaging (too high of a developer, which is VERY unnecessary, or metallic colors, which can make it almost impossible to change your hair color without frying it off or turning into a muddy green tone). Haven’t you noticed most boxed colors have an oil to add into it when mixing? It’s a buffer to try and reduce damage from using the cheap products on them. 5. Youtube may have some AMAZING tutorials, but if you know nothing about hair besides what you learned on Youtube, chances are getting the outcome you wanted without ruining your hair is nearly impossible. Youtube home hair coloring fails and you’ll see some crazy things. There is no guarantee you or someone else can recreate the look you’re going for. A color starts at $65 at the shop I’m in. A color correction on the other hand starts at $85 an hour. You may only be in the chair for two hours, you may be in it for 10! In the long run, a cheap hair color could end up costing you anywhere from 2-10 times more than you paid for it in the first place. You wear your hair every day, and you should love it!! This entry was posted in and tagged beauty, hair, hair stylist, hairdresser, school, stylist on April 25, 2016 by admin.